Chris Taylor's newest game promises to be a mix of RPG, RTS, and MOBA. 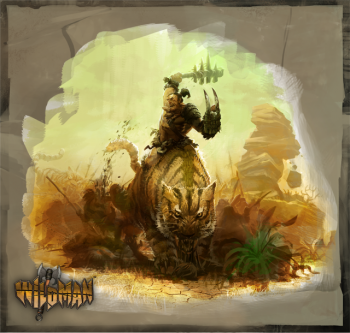 Successfully concluding their countdown , Gas Powered Games has announced a $1.1 million Kickstarter for Wildman - which is advertising itself as a "thrilling mix of action-role-playing and real-time strategy." Gas Powered Games, founded in 1998, has experience in both of those genres, with previous offerings including Dungeon Siege, Supreme Commander, and Demigod. The Kickstarter describes the game as a series of MOBA battles, between which players go on RPG adventures to earn new treasure, equipment, and skills. Gas Powered Games says that they have already started work on Wildman, but will need funding from Kickstarter to finish it. "We want to follow more closely the examples of companies like Valve and Blizzard," says the Kickstarter page, "who iterate on as many ideas as possible before settling on the "right" features." They claim to have left some features blank for the final phases of design so that they can test out as many ideas as possible. Gas Powered Games aims to deliver the game within a year of the Kickstarter, so presumably by February 2014. The Kickstarter promises a list of industry talent, headed off by Chris Taylor, the designer of such games as Total Annihilation and founder of Gas Powered Games. Additionally, the game will have music by Jeremy Soule, the composer for the Skyrim soundtrack. The Kickstarter page admits that without the funding from the Kickstarter, the release date of Wildman will be "in jeopardy." There seems to be an implication that without the crowdfunding, Gas Powered Games may be unable to pay the salaries of its staff, and would have to seek external funding to finish. As Gas Powered Games says: "We will only release Wildman when it meets our quality bar." The game's official site sums up GPG's optimistic opinion on the project, saying that "We can't speak highly enough of what Kickstarter and crowdfunding represents for companies like ours. They represent freedom."